Toddington Guest House is conveniently situated half a mile from Junction 12 of the M1 motorway. We are close to Luton and Dunstable on the High Street in the heart of the old village of Toddington. 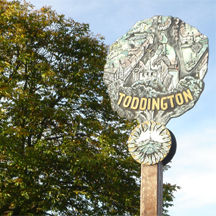 To see the location of Toddington Guest House, please follow the link to Streetmap. For detailed driving directions, please visit the AA Route Planner and input our postcode in the destination field. There is a convenient bus service which runs six days a week and stops next to the Guest House on the village green. A timetable of this service can be viewed here. Harlington train station is only five minutes by car and from here you can get the Thameslink service with frequent trains into central London. Luton Airport is twenty minutes by car and offers quick and easy access to the rest of the country and mainland Europe.